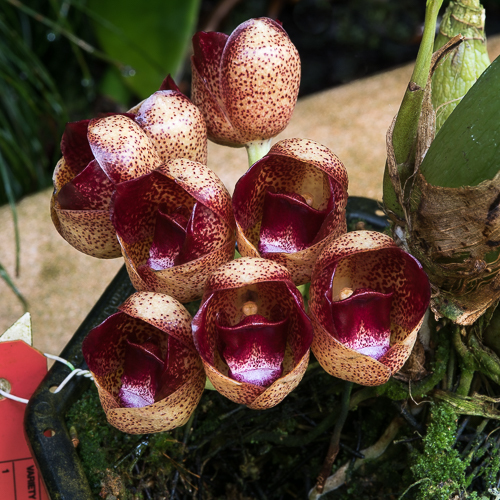 It is fascinating to observe all the different ways in which visitors and staff like to experience the orchids here. Many people like to experience the flowers through the lens of their camera, lingering on visual details. Others visit each and every flower, inhaling deeply. 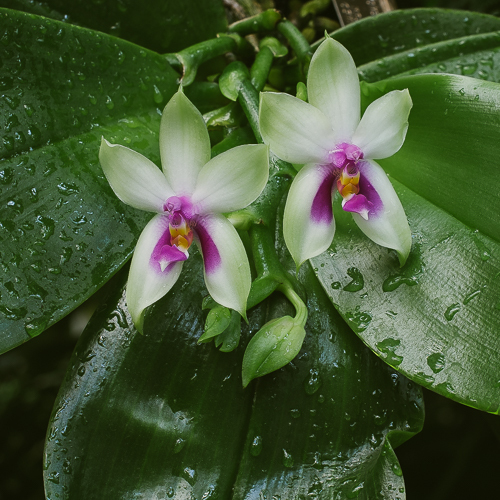 For connoisseurs of fragrance, summer is without a doubt the best time to visit the Orchid Center. Here are a few of the best this week. Phalaenopsis bellina is perhaps the most fragrant of the moth orchid species. 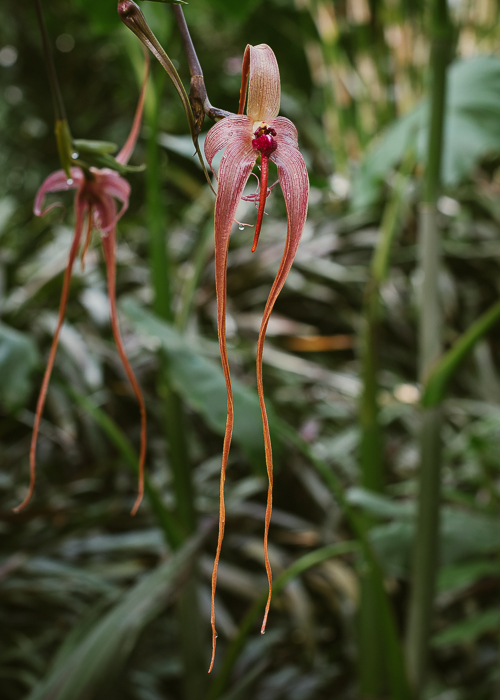 "Fruit Loop orchid" is the common name suggested by Eric Christenson, the taxonomist who separated bellina from the closely related violacea on the basis of fragrance and morphological differences. Its fragrance is blend of many compounds, including geraniol, which has a rose-like scent attractive to bees; and linalool, a floral/spicy fragrance. 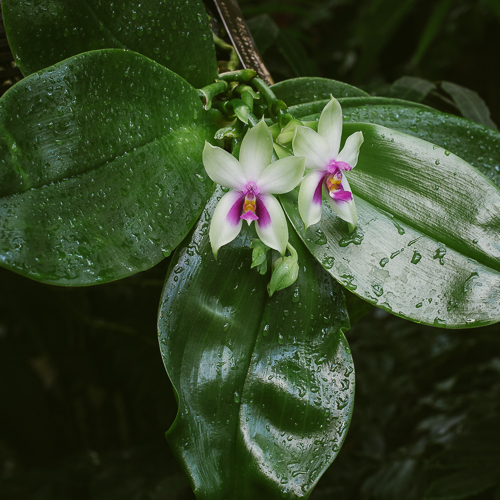 The quantity and quality of an orchid fragrance can be dependent on the time of day, and you may notice that our bellina seedlings are almost scentless in the early morning and very fragrant later in the day. 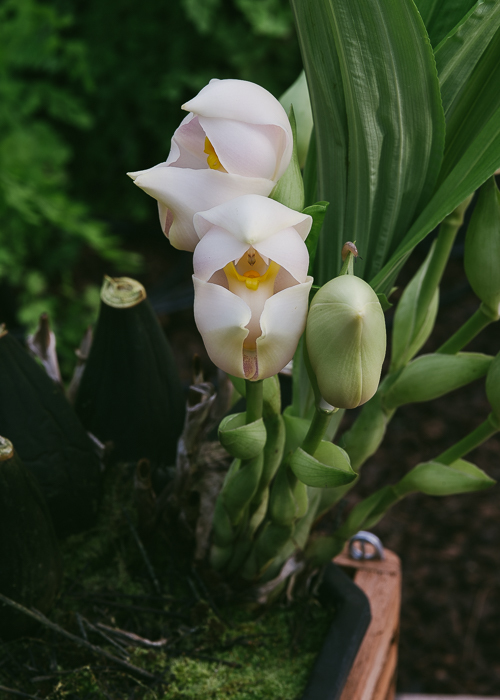 Anguloa uniflora, one of our tulip orchid species, smells like wintergreen, an unexpected but wonderful pairing. Wintergreen is the fragrance associated with methyl salicylate, a volatile compound that is a common component in floral fragrances that attract male Euglossine bees. 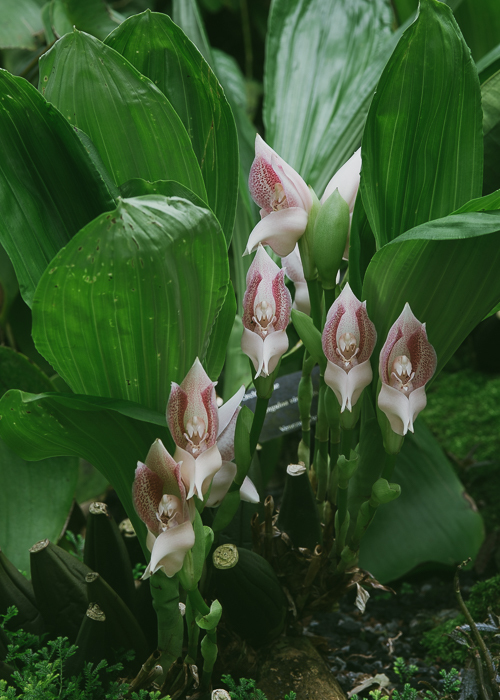 The composition of the fragrance of an orchid species can vary from plant to plant to a striking degree. If you take a moment to smell several of our unifloras, you will notice that one of our accessions produces an especially powerful wintergreen fragrance, the others less so. I'm not going to talk about the slug who brazenly made his way to the top of a floral bract while I was composing this shot, except to say that he is no longer with us. Anguloa virginalis has a sweet, but somewhat medicinal fragrance composed of 1.8-cineole, limonene, myrcene and pinene. By mid afternoon, our three plants can fill the back of the High Elevation House with an invisible fragrance plume. Peristeria lindenii was here and gone in a flash typical of short-lived Stanhopeinae flowers, but with a complex fragrance unlike any other I that I know of -like a fruit salad over a layer of eucalyptus (cineole). The practice of dipping your nose in every beautiful orchid flower will eventually yield a bad result. Lovely though it is, Bulbophyllum echinolabium produces the kind of stench that might make you think about alerting the Public Health Department, but only when you get really close. It reels in unsuspecting people the same way it would lure a fly, with brilliant red colors and long wafting sepals, until nose meets flower, then there are cries of outrage and indignation. Don't say I didn't warn you.